New York and Company is running some great promotions RIGHT NOW! Buy One Get One 50% off on jackets, pants, tops, and skirts. Lots of cute accessories on clearance!! 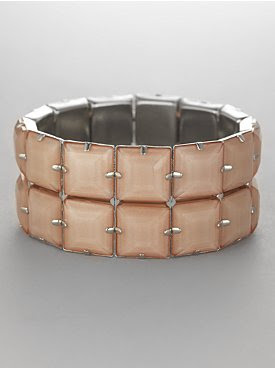 Like this cuff for $5! This cute ruffle tee is only $11.50, and this shade of lavender is hot this Spring! Don't forget to go through Ebates for 3.5% cashback or ShopAtHome for 5% cashback! !